The following graphic visualizes the steps required to create, test and deploy a DML Mapping to the runtime environment with Mapping Services. The following list gives a brief overview of the steps necessary to create and manage a DML Mapping with Axway Mapping Services. Start to design your Mapping by creating a DML Mapping Project. The main entry point for each Mapping Project is the project file project.ms. In the second step, create or import Business Documents for holding the input and output message data. These Business Documents are the input objects and output objects of the Mapping Flows. After that, create Maps that define how input objects are mapped to output objects. On the basis of the created Business Documents and Maps you create Mapping Flows. These Mapping Flows contain specific instructions on how to route, map, and handle the input data. To test your Mapping create test cases and test data. 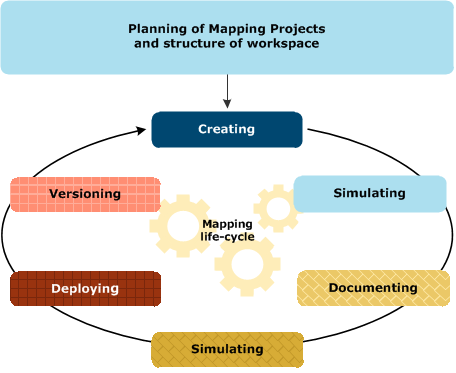 After creating Business Documents, Maps, Mapping Flows, and test cases, test your DML Mapping Project with a simulation or a simulation suite. Create documentation for your DML Mapping Project. Finally, complete the DML Mapping Project and deploy the Mapping to the runtime server.